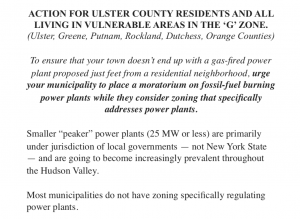 We learned that residents of Ulster County and vulnerable communities throughout the ‘G’ zone have no time to waste to address 25 MW fossil fuel power plants (where local communities have oversight) in their zoning ordinances. As promised, we have created action items for both Town of Ulster residents AND all Ulster County residents and all of those living in the ‘G’ zone. Video and PowerPoint from both presentations are available following our step by step actions. 1. VIEW Ulster County Executive Mike Hein Statement re: GlidePath. 2. VIEW Coalition Letter to Town of Ulster: Temporary Moratorium on Power Plants to Address Zoning Code. Urge your municipality to place a moratorium on fossil-fuel burning power plants while they consider zoning that specifically addresses power plants. 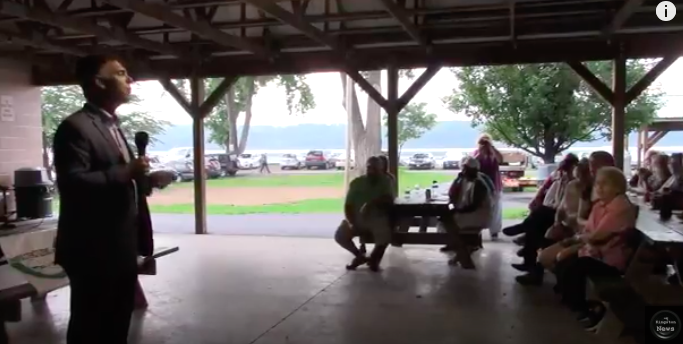 The next Town of Ulster Town Board Meeting will occur on Thursday, August 16th at 7:00pm at the Town of Ulster Town Hall, 1 Town Hall Drive, Lake Katrine, NY. 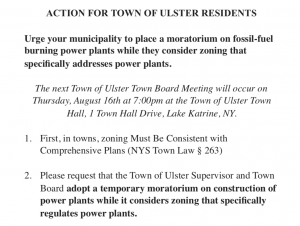 2.Please request that the Town of Ulster Supervisor and Town Board adopt a temporary moratorium on construction of power plants while it considers zoning that specifically regulates power plants. 3.Demand that the town Supervisor and Town Board publicly state whether they consider the GlidePath project a “utility company structure” permitted as-of-right in the OM zone as GlidePath has been claiming. ACTION FOR ULSTER COUNTY RESIDENTS AND ALL LIVING IN VULNERABLE AREAS IN THE ‘G’ ZONE. (Ulster, Greene, Orange, Dutchess, Rockland, Putnam Counties). To ensure that your town doesn’t end up with a gas-fired power plant proposed just feet from a residential neighborhood, urge your municipality to place a moratorium on fossil-fuel burning power plants while they consider zoning that specifically addresses power plants. Smaller “peaker” power plants (25 MW or less) are primarily under jurisdiction of local governments, and not “New York State” and are going to become increasingly prevalent throughout the Hudson Valley. Most municipalities do not have zoning specifically regulating power plants. Q. Should power plants be allowed at all in our town? Would prohibiting them constitute impermissible exclusionary zoning? Not necessarily. NYS courts have stated that municipalities can ban industrial uses as long as prohibiting a use is a reasonable exercise of its police powers to prevent damage to the rights of others and to promote the interests of the community as a whole. •With an enforceable decommissioning plan requiring restoration of the site to original condition or better. 1.Serve the distribution system: Non-wires alternatives. ConEd is actively looking for storage developers for projects downstate. 2. Hybridize existing peaker plants. NYS has 3000 MW of very old, very dirty peaker plants that need to make changes to meet new air regulations (again mostly downstate). 3. Partner with an industrial or commercial site that can use some of the batteries’ services. 4. Storage-plus-renewables. Renewables do not have to be co-located on the same site in order to get state incentives! 5. Storage only. Actively participate in the evolving NYISO and NYSERDA/PSC processes that will change the storage market landscape over the next two years AND design a storage-one project that benefits from those incentives. The role that local zoning plays with smaller power plants generally. Urge your municipality to place a moratorium on fossil-fuel burning power plants while they consider zoning that specifically addresses power plants. 1. First, in towns, zoning must be consistent with “Comprehensive Plans” (NYS Town Law § 263). 2. If power plants are permitted in our town, how should our zoning regulate them? 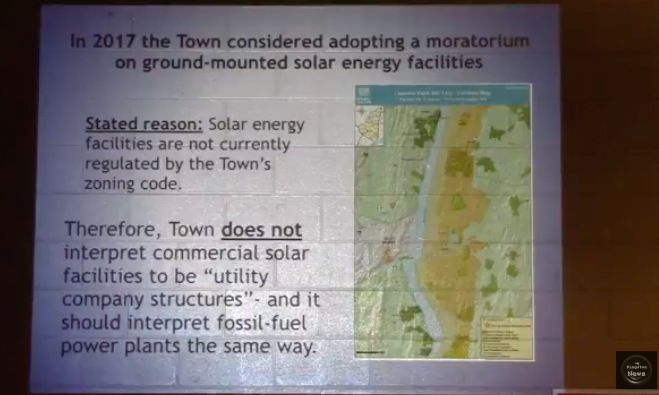 ToU History on Solar Moratorium. Action for Residents if you don’t live in the ToU. Town of Ulster Lawyer Reject Professionals and ToU Residents Request for Temporary Moratorium on Construction of Power Plants for Zoning Review.